The paper deals with the relationship between fatigue damages of railway tamping machine linkages and provisions for their loading while performing regular operations. The damages may be accounted for low cycle fatigue caused by multiple short-term overloads. Mathematical modeling lets us obtain calculation formulas to estimate the effect of specific technological factors on forces resisting the machine movement. Machine components creating the largest resistance forces and loads in the linkage have been detected. The paper gives comparative load evaluation under the main technological factors such as the lift height of the railway when tamping and constant of friction in the roller grips contact with the rail. Technological and design recommendations have been given to reduce loads in the linkages and probable development of fatigue damages. Keywords: damage, fatigue, part, resistance, load, factor, constant of friction, roller grip. Orlov P.I. Design Basics: Reference Manual. In 2 books. Book 1 / Ed. P.N. Usachov. 3rd ed. – Moskow: Mashinostroenie, 1988. – 560 p.
Sorensen S.V., Kogaev V.P., Shneyderovich R.M. Bearing capacity and settlement of machine parts for durability. Guide and reference manual. 3rd ed. – Moskow: Mashinostroenie, 1975. 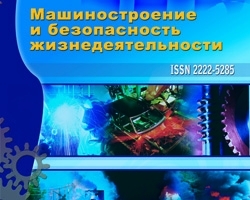 Failure factor evaluation of linkages for railway tamping machines, №1 (15) 2013, Zelinskiy V.V.